Wire Marker Cards are an industry necessity. Easy to use, vinyl cloth markers are durable and strongly adhesive. Markers are repositionable and can be taken off when you need to replace them. And, don't forget, when you buy from WireMarkerBooks.com you'll be paying about 50% of our competitor's prices! Don't believe us? Check out our price comparison chart. 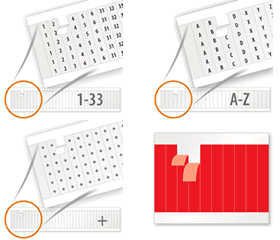 • Choose from Sequential Wire Marker Cards, Wire Marker Sheets, Solid NEMA Color Cards and Abbreviation Marker Cards. • All cards are made from durable cotton impregnated with vinyl for flexible and long lasting labels. Labels have adhesive backing for easy application. • We encourage you to look around through our entire site to find all of the tools you need to make your job easier. Need assistance? Don't hesitate to call our live support team. Wire Marker PocketPacks™ are portable and an easy way to keep track of cables and wires. Both departments below have all of the Wire Marker Card options. The Quick Order page allows you to access cards by category, so that you can quickly order or re-order multiple cards. The All Wire Marker Cards page has all of the books laid out so that you can see and compare the legends.